The sky is falling. “Climate Change” is running wild and disaster is certain unless we immediately stop burning coal and oil and move quickly to “green energy” to eliminate use of fossil fuels. Heat waves, huge floods, powerful storms, droughts and rising seas are on the verge of killing millions of us and destroying our civilization. That is my summary of the new Federal Assessment of Climate Change issued by a Obama administration team of more than 300 specialists guided by a 60-member federal advisory committee produced the report. It was reviewed by federal agencies and a panel of the National Academy of Sciences. This 600 page litany of doom and gloom has received extensive coverage by the panting anchors of the national media who feel important when tell their audience that “the sky is falling.” Horrible pictures of storms, floods, drought and heat waves leaped out of the TV sets as the New York and Washington DC headquartered media was particularly excited to tell us how the huge increases in floods and storms was the worst in that part of the nation. If you accept the picture painted by this report, the weather was just right, steady and nice in the historic past but because our industrialized society has powered its heating and air conditioning, its transportation by train, plane, cars and trucks, generated it’s electric power to run our lights, computers, television and smart phones with fossil fuels it has triggered this nightmare of awful storms, droughts and heat waves. I am deeply disturbed to have to suffer through this total distortion of the data and agenda driven, destructive episode of bad science gone berserk. The only good news is that I least where I am and on the channels and websites I saw I was not further insulted by fawning TV Weathercasters visiting the White House and interviewing the President. I best I can tell, on a national level, that turned out to be a non-event (thank goodness). Please allow me to hold your attention for a few minutes to explain why I don’t buy into this Climate Change alarmism. 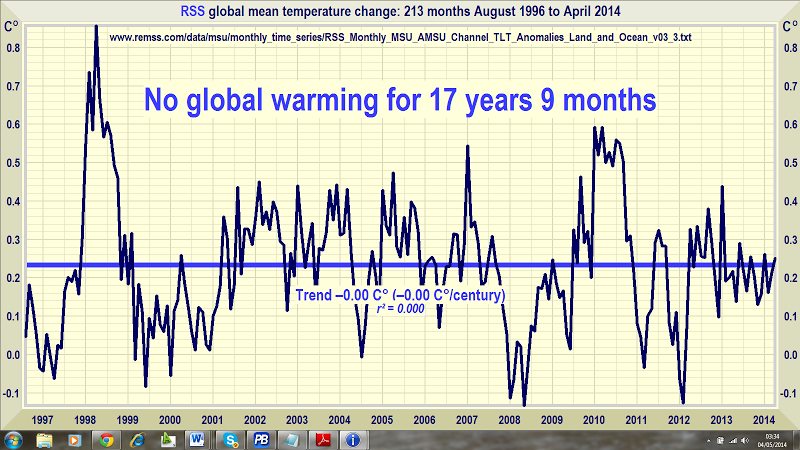 The climate of Earth has never been “normal” or stable. It has continuously changed through this planet’s 4.5 billion year history. Powerful storms, floods, droughts, heat waves and ice and snow storms have come and gone as long as Earth has existed. The current bad science is all based on a theory that the increase in the amount of carbon dioxide in the atmosphere from the exhaust of the burning of fossil fuels leads to a dramatic increase in “the greenhouse effect” causing temperatures to skyrocket uncontrollably. This theory has failed to verify and is obviously dead wrong. But the politically funded and agenda driven scientists who have built their careers on this theory and live well on the 2.6 billion dollars of year of Federal grants for global warming/climate change research cling to this theory and bend the data spread to support the glorified claims in their reports and papers. When the temperature data could no longer be bent to support global warming, they switched to climate change and now blame every weather and climate event on CO2 despite the hard, cold fact that the “radiative forcing” theory they built their claims on has totally failed to verify. They call people such as me who debunk their non-scientific silliness as “deniers” and claim we are flat-earthers and shills for “big oil”. It is insulting and maddening. But I will not be silenced. And neither will the thousand others, many of them with Ph.D.’s and on the faculties of major universities who are working to stop this bad science that labels CO2 as a pollutant and blames it for every shift in the weather. We will be gathering, we global warming skeptics, at Heartland Institutes 9th International Conference on Climate Change, July 7 – 9, 2014 in Las Vegas. You can learn about that conference at http://climateconference.heartland.org/. I will be one of the speakers at the breakfast session on Tuesday July 8th. Look at the list of speakers on the website and you will see an impressive group. A group of the powerful Ph.D.’s in the group have recently published a complete scientific document that totaling destroys the climate change alarmism of the US Democrat Party and the United Nation’s Intergovernmental Panel on Climate Change. You can find that publication on line at http://climatechangereconsidered.org/. So today to launch his new campaign the President has invited a group of television Meteorologist to the White House to interview him on the topic. The barrage of publicity will be deafening. I deeply regret that the global warming/climate change thing has become a partisan political issue. Al Gore made global warming a Platform issue for the Democrat Party and it is now accepted without serious study or scientific consideration by a vast majority of liberals in this country. And, as politics goes, the Republican Party denies global warming because it is a key issue of the other party without even studying the science. There are thousands and thousands of scientists who know without a doubt that the entire matter is based on bad science. We fight with everything we have to inform the public of the truth, but the dominate liberal media shuns us and the global warming team calls us names and insults us. We know we right and we try to explain that this global warming campaign is costing us billions in tax dollars every year and driving up the our cost of living by well over a thousand dollars a year for the average family (and the cost is increasing dramatically in the coming years as the government enacts cap and trade regulations.) One dramatic increase is in the cost of corn. This is leading to hunger and perhaps thousands of deaths per year in the poorest nations of the world. It is not a small, “who cares” matter. You can get my explanation of how this all got started and what the bad science is all about by watching my videos on this website or following my links to active climate change debunking websites of scientists I greatly respect. I get you to set politics aside and study the science of the issue. It is important. Meanwhile, somehow I will get through the next 48 hours or so of massive publicity on the issue.